Recent economic history has done a good job of demonstrating that people can lose their heads during asset-price booms, assuming that prices will keep rising forever and overpaying for assets as a result. That being said, it also seems probable that people overreact to asset-price crashes. Given the hammering stock values have taken, it seems probable that there are some good deals out there: companies that have strong business models and future prospects, but which have shares trading cheaply due to excessive pessimism about the markets as a whole. It is certainly a bit strange that people treat stocks as an asset where you buy fewer when the prices are low, while treating almost everything else the other way. It might not be a bad strategy to make a few guesses about firms that are in this situation, buy a modest amount of stock in each, and then simply refuse to look at the value of the shares for five years or so (to avoid getting depressed by medium-term losses). I suppose one nice thing about concentrating on the repayment of student loans is that you don’t need to worry too much about making investment decisions. Getting above the water’s surface is a more urgent task than investing for the long-term. Obama should pay no attention at all to stock prices. Investment professionals and econo-pundits claiming to speak for Wall Street have been blaming President Obama for the recent run of losses in the stock market. In their view, investors around the world are giving a daily thumbs-up or thumbs-down to the administration’s manifold policy initiatives. “Obama’s Radicalism is Killing the Dow,” read the headline of a Wall Street Journal op-ed by Stanford economist Michael Boskin, a former official of the first Bush administration. I read this, and I thought of the Oracle of Omaha’s famous rule of thumb—be fearful when others are greedy, and greedy when others are fearful. At the moment, others are very, very fearful. So what would Warren Buffett do? Buffet has made some bad calls recently, but he is still the master. His mastery was also my second point; specifically that it requires significant effort to attempt to, most likely unsuccessfully, emulate him. Simply investing a portion of each paycheck will insure that you are buying more stock when the prices are lower, through dollar-cost-averaging. It can be done automatically, and oddly enough makes surprising sense with the way most people make money – a little bit every two weeks. Either way you will have to do research, because random purchasing at an assumed bottom is speculation. It has been suggested that there are always good deals in any market for those willing to work hard enough, so I am sure there are undervalued companies out there, but downturns aren’t usually the source of undervalue because the good companies do not get discounted. JNJ is still a solid company, and surprise, surprise, it has retained almost all of its value. It might be an interesting time to buy an index to benefit from the cyclical nature of some sectors without assuming too much risk. Speculating on the deeply discounted companies means you might be buying the worst of worst company, buying the index gives you purchase value on, what I consider to be the more reasonable assumption, that not every company in the sector is toxic. 2) Start making similarly sized payments into ING Direct’s RSP Mutual Fund. Because it’s an RSP, it is tax-deductible. It is also relatively low fee (1%) and broadly based, covering Canadian Bonds (DEX Universe Bond Index), Canadian Stocks (S&P/TSX 60), US Stocks (S&P 500), and International Stocks (MSCI EAFE). All I would be speculating on is that these four indices would grow across the span of decades. If they don’t, all investors will have big problems (not to mention most people planning to retire). You shouldn’t have any problems if you are buying mutual or index funds. The main concern there is the MER, which isn’t unreasonable at 1%. Ideally, I aim for 0.5% for indices, since they are unmanaged, but they are relatively rare. At any rate you’ve researched the amount of research you would have to do considerably, even if you are buying an actively managed fund. The only other really important consideration for mutual funds (for minimal research investing) is to check the management’s track record and be cognizant of how long they are going to stay. I have no idea how much interest you pay on student loans, but it might be a good idea to pay them back as slowly as possible. Generally, student loans tend to be a large leveraged investment since they charge low interest and are amortized over a long period. If you believe the market has, or is close to bottoming, it makes sense to put the money back into the market. However, paying down the loans will give you a guarantied rate of return, and peace of mind. The BOC has been making noises about printing money. I wouldn’t buy anything that kept money in inflation-affected investments until the recession is over. The market generally leads the recession by six months. What is the alternative? The traditional hedge of commodities have been affected. I still think the discounts are here, and buying companies or sectors that supply essential services will pay off. A basket consisting of 25% Canadian stocks, 25% US stocks, 25% international stocks, and 25% Canadian bonds is up 5.7% since March 31st. Peter, you don’t get to decide whether your investments pay off. Of course they will go up nominally. If the BOC starts printing, however, the nominal value of investments becomes much less important. And, you don’t get to know in advance whether this happens or not – but you can be sure that lots of polling has been going on, judging how much intervention the public is willing to support to quell the recession. Money is just a commodity like any other, with two differences. One, it has no use value, and two, its supply is restricted by political actors rather than market forces. Of course they will go up nominally. Um… take a look at stock and house prices over the last year or so. The same four-way split index of stocks and bonds I described before is down 21.32% from where it was a year ago. Milan, you seem to think I’m talking about the past, or in general. But I’m talking about the future – I’m saying its quite clear that the nominal price of stocks and bonds will go up in the future – because either the market will recover, or we will turn to inflation as a means of getting out of the depression. Again, I don’t think the story on inflation is so simple. Look at the last decade or so in Japan to see how impotent monetary policy can be when the banking industry remains seriously damaged. I also wonder what effect inflation has on the real value of stocks. It’s possible that people holding them aren’t really affected, since people buying stock with inflation-increased stocks of dollars will drive up the nominal value of existing holdings. While I am speculating completely on this, such a mechanism could make stocks something of a hedge against inflation. Look, I’m not saying I’m absolutely certain of anything. I’m just saying that printing money can lead to inflation, and that it might happen. It’s impossible to tell if printing money will cause inflation – because the relation of M0 and M3 is complex, depends on social-psychological factors, how habits change, etc… However, it’s certainly possible for an increase in M0 to increase M3, and it’s certainly possible for the oversupply of any commodity to lead to the reduction of value of that commodity in relation to others. And, if that happens with money, everything priced in money might go up in price without going up in value. I’m not saying I’m certain of any of this, I’m saying I think this is what will happen. I’m certain in the sense that I’m willing to be wrong about it. That seems fair enough. It is very sensible to be more worried about inflation when governments are borrowing heavily. The question, probably better addressed on the inflation thread, is what actions individuals should take to protect themselves, given the total set of economic and other issues they face. Personally, I think a modest investment in stocks in a period when they might have undershot fair values is a sensible idea. The “I think” applies to both clauses. Obviously I don’t get to decide reality. You’ve ignored my question: What is the alternative? Someone is looking to invest, so I offered some advice on investing. What do you suggest to avoid the effects of printing money? In context of this conversation, where someone is thinking about investing, and I presume he will be buying mutual funds with cash, the implication of advising against investing seems to be to hold cash. The lack of alternative investment suggestions also supports this. In what way does holding cash protect one from the effects of a central bank printing more? I think you can buy bonds that have returns linked to inflation (i.e. 1% above the rate of inflation, for a certain period). The question is whether the lower return is justified in exchange for the added safety. Inflation-indexed bonds (also known as inflation-linked bonds or colloquially as linkers) are bonds where the principal is indexed to inflation. They are thus designed to cut out the inflation risk of an investment. The first known inflation-indexed bond was issued by the Massachusetts Bay Company in 1780. The market has grown dramatically since the British government began issuing inflation-linked Gilts in 1981. As of 2008, government-issued inflation-linked bonds comprise over $1.5 trillion of the international debt market. The inflation-linked market primarily consists of sovereign debt, with privately issued inflation-linked bonds constituting a small portion of the market. Government of Canada Real Return Bonds pay attractive real rates of interest and are fully guaranteed by the federal government. They are available for terms up to 28 years, and are essentially risk-free if held to maturity. They have all the benefits of regular Government of Canada Bonds, plus they guarantee a rate of return that is adjusted for inflation–so you don’t have to worry about the effect rising prices will have on your retirement income. If you are looking for the above mentioned features, but do not require income, consider investing in a Real Return Stripped Bond. Minimum investment (at face value) is approximately $5,000. Please note that the actual settlement amount is adjusted for inflation. Current bond issues available mature in 2021, 2026 and 2031. Since the Bank of Canada estimates the CPI (to which the Real Return bonds are linked) at 1.2%, I think that means the current nominal return on the bonds is 3.22%. By contrast, ING Direct savings accounts are yielding 1.5% nominally (barely above CPI). Of course, buying Real Return bonds locks you in for a longer period, during which returns available otherwhere may rise. At ING, one year GICs yield 1.5%, three year GICs yield 2.25%, and five year GICs yield 3.00%. You can even buy index tracking funds where the assets consist of a basket of government-issued index-linked bonds. Inflation-Linked Bond ETFs – Time To Buy? It’s impossible to track inflation. The CPI in the US was notoriously fudged all through the 70s – there is no reason for us to expect that in a serious inflationary period, the state would tell the truth about inflation – that they would not modify the CPI measurement to under-report it. In fact, it would probably be morally wrong for the state not to lie about inflation in that kind of a situation – telling the truth might have disastrous consequences on investor confidence, and worse consequences could arise. I think it’s still a good time to buy silver. Want to put some money to it and see which does better over the next few years? I was about to buy a bit more of that index fund, anyhow. I will do so on Tuesday. It’s impossible to track inflation. Employees need leverage to oppose the 2% tax which is imposed every year called “inflation”. If nominal wages remained the same, there would be a real-wages pay cut of 50% every 45 years – just do the math. Inflation is caused by increasing the money supply with respect to the size of the real economy. Central banks do set inflation, but it’s a mistake to think they ‘control’ it, as if it would do anything without their say so. If they wanted to set it at zero, it would be exactly as simple as printing 2% less new currency. In reality, it’s a bit more complicated than that because we have a fractional reserve system (at 10%, it means there is about 9 times as much money in deposits than there is in bills), but the principle remains the same (although, for obvious reasons – instability goes up). But of course, we couldn’t have a full-reserve system or the banks couldn’t make any money. My position hasn’t changed, but I have spoken in quite an unclear manner. By “you can’t track inflation” I mean inflation manifests itself in a way we can study only empirically, which means subject to fallibility. Inflation, I believe, is a real lawlike phenomenon – that obeys the same laws other commodities do. You can never measure this – it’s behind the appearences. Specifically, you can track inflation – but you do so contingently, based on the things that you happen to value. I for instance notice inflation when the prices of things I buy goes up. But, this is just my particular aspectual experience of it – I’m not experiencing inflation as such, just some of its effects. Inflation might make the prices of some things go down, so technically those lowered prices could be called inflation because they are effects of inflation – but I wouldn’t call them that. Specifically, you can’t trust the state to track inflation properly, because it has an interest in lying to prevent catastrophic lacks of confidence in the economy. Neither should we blame the state for lying to us – it’s probably better for everyone that the US lied about CPI throughout the 70s. Technological change is another spanner in the works. A significant portion of total spending consists of things (cars, appliances, computers, photo and video equipment, etc) where the version you can buy new in any particular year probably isn’t available five or ten years before or after. As such, it’s hard to know what counts as an equivalent product. I can only put imaginary money towards silver, unfortunately. You can buy a one ounce silver coin dedicated to coal mining for under $75. That said, it is probably overvalued, compared to a slug of unfinished silver metal. I’ll wager imaginary money. As hollow as that sounds, it really isn’t. It is only my poverty and not my extreme overconfidence in my position that prevents me from actually investing. I’m actually quite sad that I don’t have really money to invest in what Buffet has called ‘the buying opportunity of the century.’ After all, having my retirement fund crushed isn’t fun without the ability to double down. How about we wager real money, or beer, on imaginary results? How long a time span are we considering? It seems like it has to be five years or more to capture the full effect and resolution of the current crisis. How will we evaluate the effect of inflation across that timespan? Silver right now is about 14$ an ounce. Buying a one ounce coin for 75$ does not look like a sound investment strategy. Does it matter? The rate of inflation will be the same for all of us. The resilience or susceptibility to inflationary pressures of the respective investment vehicles we choose will do the work for us. We might not be able to tell whether any of gained real purchasing power with our investments, but a comparison of the nominal returns should measure the relative performance, since they will all be divided by the same quotient to ascertain the real. I think it is likely that stocks and bonds will outperform precious metals over the next five or ten years, and that the difference will be even greater further out. You think sovereign states will default on their debts? That seems to be at odds with the idea that they will seek to reduce their real burden through inflation. Or do you mean corporate bonds? Municipal ones? I don’t understand your question. A crash is when the perceived value of a commodity rapidly drops. This could, I suppose, happen if it was believed that defaults would occur. Or, it could happen if it was perceived that the value of the bond at maturity was less than its current value. The argument is that the bond market is being held up by speculators, none of which actually want to hold the bonds to maturity. But, if there are no buyers who wish to hold the bonds to maturity, at some point there will be no more buyers yet sellers will remain – and ergo the price drops. This applies derivatively to all bonds, but primarily to treasury bonds. There is a derivative application simply because the value of all bonds is affected by whether the treasury can sell its bonds overseas. If the rate of borrowing reduces, then the rate of increase in the money supply will need to go up – causing inflation, and reducing the value of all bonds. If there is a perception that the dollar has dropped, and will continue to drop this will cause a selling frenzy in all domestic cash based securities. It all comes down to a basic fact – bonds and all other cash based securities, and cash, are valuable because of their scarcity with respect to goods and services. But their scarcity only comes from the market on one side, whereas all “normal” commodities have the origin of scarcity in the market on both sides (demand and supply). See, Tristan disagrees. Peter Schiff makes some good points, suggesting you want to hedge against currency fluxations. I look forward seeing it put into practice. Time to open the wagers on the imagining investing game. Shall we say, real or imaginary investments of $500, with the net results (minus fees, etc) evaluated in terms of nominal Canadian dollar value in one, five, and ten years? Should there be any consideration given to the tax advantages of different investments, i.e. RSPs and Tax Free Savings Accounts? People trying to protect themselves from inflation would likely consider the tax system when making their plans. Also, is portfolio rebalancing allowed? It could be restricted to simply re-balancing to your original mix (i.e. back to 25% bonds), or overall changes in asset balance could be allowed. I suppose there won’t be any consideration for convenience, though it certainly has value for the average investor. Strictly speaking, we should say evaluated in terms of Canada’s lawful currency in one, five, and ten years. I was thinking $5000 in imaginary funds and we compare nominal values in some amount of time, like three years. We can eliminate broker fees and tax savings, for the same reason we don’t need to measure inflation – the costs should be (or could be made) the same for all of us. Theoretically just assume we use the same broker or Ameri-trade or whatever, because this is an investment competition and not a broker competition. We can also discount tax savings because $5000 is the yearly contribution to TFSAs, which we all qualify for (and assume we all have by now). So unless Tristan wants to do something really exotic that is beyond the investment range of a TFSA, we should all enjoy tax-free growth status. I was thinking a one-time buy for a specific window. If you want a dynamic stock picking game, then we will have to consider broker fees (but not tax implications if the initial investment could be put in a TFSA). So personal rebalancing would be out (unless you wanted this more complex game where we kept track of broker fees), but I don’t see why this is a problem because many investments will automatically rebalance. Personally, I am generally anti-rebalance, because I am company oriented rather than sector cylindrical, but the advantage of mutual funds is that most rebalance, or you can just setup hedges by your choices of initial investments. I choose the largest amount allowable for TFSA contributions to give us enough money to play with – it is large enough you can choose whether you want one or many types of investment, you can set up hedges, etc. We could choose a day when the investment allocations had to be reported and each of us would be allowed to allocate (transaction free – if we are doing the single allocation game) at the closing currency rates and share values, and then we repeat this process when we sell. We then compare the nominal values to show relative performance. For interest sake we can even use the standard measure of inflation to determine the real – to see if any of us should have invested at all. Tristan will remain suspect of it, and he has made some good points about how inflation is calculated and tweaked, so the real returns will remain questionable especially if the official inflation produces a quotient near zero, but the relative comparison is the important one, since the highest nominal will represent the largest return or small lost in real terms. Just like we’ll let structural rebalance, we can also allow structural buying, like dividend reinvestment programs, but it hinges on whether the investment choices offer the program. Not all modes of investing have the same fees associated, especially when it comes to instruments like mutual funds. Since the aim is to evaluate which real-world option is best in a period when increased future inflation is plausible, I think they should be taken into account. Personally, I am just going to put $500 of real money into the index tracker mentioned above (1% MER) and multiply the final value by 10 to make it equivalent to your hypothetical bets. There are other organizations that would produce the same instrument for a lower fee (namely, Vanguard), but I prefer to stick with a Canadian institution and Canadian dollars, and I don’t know of a firm comparable to Vanguard on this side of the border, when it comes to low-fee index trackers. I wasn’t suggesting that we should ignore MERs. Those are costs attached to a particular type of investment and part of the investing strategy. I did think we could waive broker fees and currency exchange rates for a one time purchase game to simplify. I think it is desirable to have the focus on picking the proper investments (including an analysis of the associated costs) rather than spending time cruising websites for the lowest DIY purchase rate. Obviously choosing an reliable, honest, hard working broker that doesn’t overcharge you is an important part of (real) investing. However, I thought we could simplify the one time buy game by assuming everyone enjoys the same initial transaction costs. But it is just as valid, as you’ve suggested to say that one should do the currency assessment, and factor the exchange costs, if you want to enjoy the opportunities of foreign equities. I was just proposing one possible format (which was designed for simplicity, while maintaining a large enough pot for some potentially complex strategies, rather than being tailored to your actual $500 investment – I think it is great you are going to actually invest, but with that amount, it is likely only one investment choice will be made. Which, while a smart choice practically, it makes for a less interesting game if everyone’s strategy consists of buying 10-50 shares of one company, with no hedges, etc). Other people are free to make their suggestions, or if there is no interest, we can give up on the experiment. People are welcome to develop more complex strategies. The basic philosophy of the low-fee index tracker is that complexity isn’t a virtue – that you can beat most complicate strategies with a very simple one, requiring only a single transaction to initiate. It’s a strategy I would be especially happy to see confirmed, since I have very little interest in the world of business, and no intent to track the performance of investments from day-to-day or month-to-month. I I agree with you. My personal investment strategy emphasizes simplicity. Incidentally, it also dislikes rebalancing (generally). But I cannot project my opinions about what constitutes good investing into the game, because the game is predicated by a disagreement about what strategy to adopt. I choose $5000 to allow other people who might prefer complex strategies to be able to execute them, while being small enough to claim TFSA induced elimination of a variable for simplicity. Having more money doesn’t prevent people from implementing simple strategies, but rather makes the choice between simple and complex strategies possible. As opposed to the staggeringly high transaction costs and position limiting factors a relatively small amount of money imposes, your choice to invest in only one fund will actually serve as a declaration of strategy. To clarify my simplicity approach, I was trying to simplify while maintaining the emphasis on selecting investments through a ‘structural’ distinction. I did put in qualifying statements. If someone wants to buy a rare sea turtle as their form of investment, than the three year feeding costs will have to be taken into consideration and it wouldn’t be in a TFSA. But I wanted it to be strategy centered, rather than scouting the web for DIY transactional discounts. MER comparisons are still investment-based research, just like turtle feeding costs would be. But I see little value in imaginary one-ups-manship – oh yeah, I really got my $3700 turtle for $300 because I’ve got a turtle connection. What strategy are you contemplating? I bought 61.1247 units of the Streetwise Balanced Growth Fund, for $8.18 each. In total, that’s $500. We will see what each unit is worth at the intervals specified above. I shouldn’t pretend to know anything about investing, I’m just like any other naysayer who thinks the current system is a house of cards that won’t be able to hold itself up. I’ll put my 500 imaginary dollars in silver. It’s a good thing they are imaginary, I haven’t the slightest idea of how I would put real dollars in silver at the market price. For the purposes of the competition, I think you need to pick a real asset to pretend to buy: real coins, real shares in silver companies, etc. Things like contract or broker fees are legitimate part of assessing the value of an investment. Also, you can pretend to invest $5,000, in as many instruments as you want. This site is selling 100 oz silver bars for US$1,491 before fees. You could ‘buy’ three of those, plus some smaller items. How about we wager real money, or beer, on imaginary results? Are we actually wagering anything here? I would be fine with a small amount of money or beer. Sure. I’d be willing to wager. I’m cocky, so I think I can beat ING. But we should probably get the logistics worked out soon, so we are all buying at roughly the sametime. I am happy to use the unit value at whichever date you two decide on specific strategies. As for the wager, why not go with one beer at one year, two at five, and three in ten – from each of the lower performers to the person who does best in that time period? If you would prefer monetary amounts (which might be logistically easier), I am fine with that. One of the reasons we are such big fans of the Easy Chair portfolio (which we’ve been following for the last two weeks), is because it fits with our philosophy of life, parenting, partners, vacations, gardening, renovations, cooking and investing. Keep It Simple Smartie. The original Easy Chair featured only four investments: 20 per cent went into the Beutel Goodman Money Market fund, 30 per cent into a 5-year Canada Savings Bond, 35 per cent into TIPS 35 and 15 per cent into SPDRs. TIPS 35 mirrored the old TSE 35 Index and SPDRs, listed on the American Stock Exchange (ticker symbol SPY), tracked the S&P 500 Index. The Easy Chair looks pretty much the same today. The bond has matured and Kirzner invested the money in one of the new bond exchange traded funds (ETFs). He chose iShares CDN Bond Index Fund (ticker symbol XBB), which replicates the performance of the Scotia Capital Universe Bond Index. It is a medium-term bond index holding federal, provincial and municipal bonds as well as investment grade corporate bonds. The return, since inception in 2000, is 6.72 per cent. How about the two of you get until the end of next Friday (midnight Toronto/Ottawa time) to choose a specific strategy? After that, I start getting to count gains on the one I have already established. The practicalities of how the investment are made are relevant from both a financial and a practical perspective. For instance, I could have created the same basket of four indices with a lower management expense ratio by purchasing four exchange-traded funds, rather than relying on ING’s pre-rolled 1% option. Doing the latter is more convenient, both in terms of the initial investment and subsequent rebalancing. It didn’t require stating a relationship with a new financial institution, and it is a pure ‘fire and forget’ investment. That being said, it might have been sensible to hedge it by putting part of the portfolio in a GIC, especially when it comes to performance across short timespans. Sure. I’m not disparaging ING for your actual investment. Different people value investments differently. E.g. I am hoping this beer bet will be one of my most satisfying, even though very little is actually at stake. But you’ve got to keep throwing jabs into other people’s strategies. Dominate the psychological game. The trash talk needs to be elevated to increase the excitement. Like Tristan should be warning us daily about how hyperinflation is going to get us, and then zombies are going to eat our faces. How pleasant for those with student debts! How pleasant for all those with debts of any kind. Actually, maybe Hyper inflation won’t happen. It would be too good for too many of the less well off. I wonder how they can avoid hyper inflation by doing something that hurts poor people a lot. Actual hyperinflation seems likely to harm pretty much everyone – look at Zimbabwe or Weimar Germany. The only people who really benefit are those who are able to use it as a pretext to take over large amounts of real property at what eventually prove to be terrific prices. Hyperinflation benefits tycoons and corrupt politicians. It’s true, hyperinflation results in the coagulation of industry. In other words, mergers and acquisitions would be going crazy. The U.S. news media has convinced many investors that oil consumption is falling because of the global recession. While that may be true, it’s a disservice to millions of investors because production is declining at a pace that’s actually three times faster. And that suggests higher oil and gasoline prices in coming months – perhaps as much as 50% – 70% higher, or more – particularly if a U.S. economic recovery is truly in the offing. To really see what I’m talking about, let’s start with a close look at consumption. I’m asked about this frequently in my global wanderings, most recently at the Las Vegas Money Show last week. According to the U.S. Energy Information Administration, oil consumption fell by nearly 50,000 barrels a day throughout 2008. According to the latest figures, the EIA suggests that global oil demand may slump to 83.4 million barrels a day in 2009 – nearly 2.4 million barrels below 2008 consumption levels. On a percentage basis, that’s almost a 3% drop. I have my doubts that we’ll actually see a decline of this magnitude, but if it does occur, it will be the first time ever that consumption has declined for two straight years. That alone is pretty noteworthy in this era of cohesive and powerful global growth. The reason I have my doubts about such a steep decline in demand is this: While overall consumption is dropping in such developed economies as the United States, Europe and Australia, it’s being at least partially offset by continued growth in China, the Middle East and Latin America. Because the data produced there is less than transparent, I can’t help but think that analysts are underestimating the growth we’ll be seeing in those markets, where consumption is accelerating strongly. And it’s entirely possible that growth in those markets will outstrip any fall here in the developed world. Hmmm good mind games. Maybe I should buy oil instead. Can I just buy 500$ worth of petrol, and some fuel stabilizer? Sure, though I think we’re going with $5,000 imaginary purchases and a 10X multiplier on my real $500 purchase. The latter, incidentally, is still at precisely the same value as when I bought it – $8.18 per unit. You can invest in anything you want to. I’ll even let you write off tuition if you can find some way to quantify the difference monetarily, improving yourself with a few more classes on Heidegger will make. Although, investing in yourself is probably a bad bet given the beer time frame. This is somewhat off topic, but have you considered ecological or ethical funds for your actual investing? Are there ecological or ethical ETFs? How credible are their claims to ethics and/or greenery? How volatile are they relative to whole-market indices? What sort of management fees do they charge? Also, what sort of institution would I buy them through? There are… and those are all good questions. I wouldn’t recommend them as an investment. I was just wondering if you had considered them, and had an analysis of them. I can’t remember the last time I have seen information on ethical funds, (green funds are even more rare), but the returns are generally lacking. I don’t remember volatility being a problem, and conceptually this makes sense since the rate of return is the main investment disincentive these funds are not likely to go from hot to cold like Nortel. (they aren’t likely to go to hot at all – sorry, I couldn’t resist). Settling the investment quality aside for a second, you’ve already aptly noted the main ethical/factual problem with these funds – their claims are suspect. MERs vary, as with any other fund. You probably won’t find a 0.5% MER of an index fund, because 1-2% is standard for actively traded funds, so I would assume 1-2% would be the low end. You should be able to get information and buy them through any reputable broker. Depression 2.0: Creative Strategies for Tough Economic Times is part of the same series of Process books that includes The Urban Homestead, Preparedness Now! An Emergency Survival Guide for Civilians and Their Families, and Getting Out: Your Guide to Leaving America. By most economic indicators, America is inching toward financial collapse. The familiar signposts are all too visible: profligate spending, a debased currency, bank failures, record foreclosures, and the looming threat of a crippling energy crisis. We have grown accustomed to living in a stable, prosperous society, and many of us may not be prepared for a shock of this magnitude. Depression 2.0 is a practical, empowering, hands-on guide to persevering and even thriving in the event of an economic crisis. Placing particular emphasis on self-sufficiency and personal resilience, this timely, informative book offers a hopeful way forward in a time of great uncertainty. Bankruptcy, barter, and survival investing are just a few of the important topics explored. Depression 2.0 is the fourth title in Process’ celebrated Self-Reliance Series, created to help urbanites make smart choices to live sustainably and self-sufficiently in the twenty-first century. Let me guess — this used to be a ten-year-old book about the coming Y2K apocalypse, then the authors revised it to trigger this year’s hot-button panic issues. Ten years from now they’ll have it back on the shelves as a guide to surviving coastal flooding or oncoming asteroids or whatever. That isn’t an argument. The argument that we’ll see hyper inflation is simply that the US will not curb its spending and China will not continue to buy its treasury bills. Spending can then continue only on the basis of the fed monetizing the treasury’s debt. Otherwise there will literally be no money to pay government employees. The monetary base of the US has already been significantly increase. Why don’t we ask Marc what would happen if the m0 to m3 ratio returns to what it was before increasing the monetary base? Not an option available in the case of US hyperinflation, perhaps, but relevant to how other states might respond to it. In any case, you and Peter have until tomorrow to post specific investment strategies. The deadline has passed. Are you two backing out or posting something? My shares are up to $8.24. * Seeks to provide investors inflation protection and income consistent with investment in inflation-indexed securities. * Invests in high-quality inflation-indexed bonds issued by the U.S. Treasury and government agencies as well as domestic corporations. * Maintains a dollar-weighted average maturity of 7 to 20 years. * Principal and interest payments are adjusted quarterly in response to changes in inflation. Tsk. Tsk. No follow-through from these fellows! In the meantime, the commercial Crown corporation is saying little beyond noting there was a 352-per-cent increase in production of its Gold Maple leaf coins last year. TO READ the papers, a dollar collapse is imminent, past due if anything. Major emerging markets, particularly China, are asking for a new global reserve currency to displace the dollar. Deficit hawks are taking to op-ed pages signalling an end to tolerance for American debt. And some Chinese officials are trying to get America to begin borrowing in yuan, so that it can handle the exchange rate risk for once. Seems as though the dollar’s goose is truly cooked this time. Right? The BRICs are buying dollars at the fastest pace since before credit markets froze in September, protecting exports even as leaders of the biggest emerging markets consider alternatives to the U.S. currency. Brazil, Russia, India and China increased foreign reserves by more than $60 billion in May to limit currency gains as the first global recession since World War II restricted exports, data compiled by central banks and strategists show. My index tracker is up to $8.42 per unit. I am still hoping someone else will post a concrete strategy. I’m pretty boring, so I’m *buying* 375 units of “Central Fund of Canada” at 13.33 closing price on the TSX yesterday. Are there any fees or commissions associated with that? It’s just a stock, so whatever fees are required to buy stock at the TSX. Just a broker’s commission then. I don’t know how much those are. I can try to find out what that is, but I don’t think time is of the essence. I just plan to pretend hold this stock for the entire period. I can’t imagine the fees of buying 5000$ worth of stock and selling it 5 years later could be a large percentage. I would rather have bought metals directly, this is possible but a hassle. Canada doesn’t have minting of gold and silver to meet public demand, as such, when Scotiabank mints silver bars they sell out quickly and at a higher than commodity market price. Apparently, the Canadian mint has hugely increased gold coin production recently. Oh, and I’m in for whatever betting system you guys come up with, so long as the cost to the loser doesn’t get above the 50$ mark or so. But why should I worry if I’m so sure I’m going to win? I’ll tell you why. I don’t think I believe in any of this neo-austrian school theory anymore. I mean, its probably true in a sense, but its truth is useful only insofar as the house of cards system we have now can’t be propped up. Maybe it can, maybe the people who are ok with there being much more apparent value in the world than real value (or, those who are fine with a low discount rate on the speculation of future value, because it amounts to the same thing), are right? Only time will tell, and this is all about time. From what I’ve heard from the mainstream advice for investing it seems that you can’t, on average, beat the market index funds. And, it does seem that the value of precious metals has steadily declined in purchase parity power over the last century – which is what you’d expect in a growing economy. Buying precious metals is just what everyone says it is- a hedge against the worst possibilities of monetary policy. But even then, there is no golden rule that says metals are a better hedge than good stocks, is there? I still believe things like, at some point China will attempt to destroy the US economy by refusing to buy treasury bills, and converting its export based economy to one of domestic consumption – but, I’m not certain. This whole issue for me is very connected to the issue of “asserting”, “denying” or “witholding assent” from the conspiracy theory conversation. The fact that we are putting down real (or in some cases imaginary) currency seems to withdraw the possibility for “witholding assent”. What options do I have for uncertainty in situations which any action seems to itself declare certainty? For the sake of having another strategy for comparison, interest rates on GICs from ING Direct are 1.25% for one year, 2.25% for three years, and 3.00% for five years. That means a $5,000 GIC of each type would be worth either $5,062 in one year, $5,345 in three years, or $5,796 in five. There would also be no risk of losing money through falling asset value (as with gold or stocks), but only through inflation. The idea that we will see high inflation in the future as a result of our current federal budget is becoming mainstream. Inflation isn’t some terribly bogey man, its a danger like falling asset value, which is greater or lesser at different times depending on what different sets of actors do. The Daily Show has a segment of Peter Schiff talking about the credit crunch. He argues that rather than bailing people out, they should be allowed to go bankrupt. Also, that the Federal Reserve should keep interest rates high to prevent excessive risk taking. “The Canadian dollar is likely to keep rising against the U.S. greenback, not because of Canada’s stronger economic fundamentals but because of the staggering indebtedness and trade deficits of the United States. A rising dollar will slam manufacturing, but it will also hurt commodity exports denominated in U.S. dollars, thereby spreading pain all across the country, including in Alberta. Oil prices will likely rise more, especially when recovery takes hold in Asia, as it will before North America. Oil prices will help Alberta, Saskatchewan and Newfoundland but hurt recovery everywhere else. In countries that are frequent offenders, including those in Latin America, foreign creditors have in the past demanded that government debt be denominated in a foreign currency. America has been able to borrow in dollars. However, for foreign investors, that means Treasury bonds are not risk-free at all. Even domestic investors might reflect on the potential for inflation to erode the real value of their holdings. Inflation-adjusted, the capital value of Treasury bonds fell by more than five-sixths between 1962 and 1981. Here is an option for non-students who use the Bank of Montreal. BMO has different banking plans that offer more or fewer features for different prices. For instance, their ‘plus’ plan allows 30 transactions per month for $8.50. It is worth noting, however, that they waive the fee if you keep $1,500 in a zero-interest chequing account (which need not be your main chequing account). Avoiding $102 in annual fees is equivalent to earning 6.8% interest on your cash. That’s nothing to sneeze at, when interest rates on ING Direct accounts are at 1.35% (though they are compounded, which the fee elimination does not approximate). Canadian banks may be interpreting the term “high-interest” a bit more loosely than the consumers they’re hoping to sign up. After all, few people would consider 1 per cent to be a high interest rate on their savings account. But that’s precisely what has been unfolding in recent months as the economic downturn has made it more difficult for banks to offer truly high rates. “We are at historical lows,” said Peter Aceto, president and CEO of ING Direct Canada. Bank accounts marketed as “high-interest” have become one of the most popular account offerings in Canada in the past few years, and banks have jostled with each other to offer consumer the best rates. Consumers have been able to take advantage of a 3 or even 4 per cent return on the balance of their everyday chequing or savings account. The offerings became even more tempting after the introduction last January of the Tax-Free Savings Account, which promised a higher rate of return than most bank accounts. My bet is up $43.67 (8.7%) since May 20th. That sense of fair play in the market has been virtually destroyed by the bubble burstings and market drops of the past few years. Recent rebounds notwithstanding, most people now are asking whether the system is fundamentally rigged. It’s not just that they have an understandable aversion to losing their life savings when the market crashes; it’s that each of the scandals and crises has a common pattern: The small investor was taken advantage of by the piranhas that hide in the rapidly moving currents. And underlying this pattern is a simple theme: conflicts of interest that violated the duty the market players had to their supposed clients. It is no wonder that cynicism and anger have replaced what had been the joy of participation in the capital markets. My $500 is up more than 10% – at $553.04. My CFC shares are now worth 14.34, so my 375 shares are worth $5377. The Streetwise Balanced Growth Fund is up to $5,680, after fees. It would be interesting to see an updated version of the chart linked in that post. I bet the ‘global property’ line has taken quite a knock. Commodities are not really an investment at all. Investments, on balance, if chosen well, should appreciate. Commodities are better conceived as protection against disaster than investments. I think you can only think commodities as “investment” within econometrics, i.e. trying to predict the fluctuations of the market and profit from them. Just to be really clear – I don’t expect to win this bet if things go “as planned”. I would certainly like to lose this bet, actually, since winning it would likely mean people in general are worse off. For me then, it isn’t really a bet, just a representation of what I’d actually do with 5000$. I don’t even expect, even if I win, that my purchasing power will go up – just that it won’t fall as much as other options. If what we really need is an end to economic growth, and a shift to the sustainable use of resources, an increase in the relative price of commodities versus stocks could be part of that. That being said, I don’t expect that to happen on the basis of present policies. What really needs to stabilize is our net impact on natural resources through taking inputs, as well as the net impact of our wastes. That could happen while technological improvements and the internalization of externalities continue to improve the material quality of human life, as well as overall human welfare. Put your hard-earned savings only in ultra-safe GICs — and rest assured that you are earning returns on par with those in the stock market. Don’t listen to conventional advice that it’s never too early to start saving for retirement — wait till you are over 50 to start your RRSP. That’s the word from chartered accountant David Trahair, who has written books on personal finance such as Enough Bull: How to Retire Well Without the Stock Market, Mutual Funds, or Even an Investment Advisor and Smoke and Mirrors: Financial Myths That Will Ruin Your Retirement Dreams. One reason for thinking that recent stockmarket gains may be short-lived: private equity firms are trying to cash out of their investments. CFC shares seem to be $14.69, which translates to 5508$ for 375 shares. I would have expected a greater increase, given the spike in gold prices. My shares are at $9.11. I bought them at $8.18, so they are up 11.37% since May 20th, 2009. That said, a lot of that stock market rise could be an unsustainable response to massive stimulus spending and bank bailouts. My CFC shares are at 15.19$, I “bought” them at 13.33. So, they are up 14% since I “bought” them. Looks like for now I’m winning! A big part of the appeal of index trackers is that you can buy them and forget about them for a few decades. As for the unsustainable price, the same is true for pretty much all assets. Once people realize what a fiscal mess we made staving off the recession, it is quite plausible that the value of many asset classes will fall. Gold certainly looks seriously overvalued. Gold will fall when people realize we’ve made less of a mess than the market is predicting. 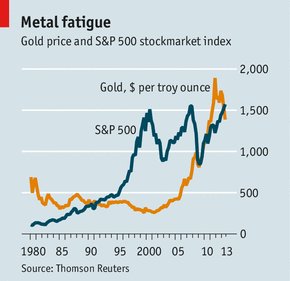 Gold is largely a “fear” commodity – its price will go down when the economy recovers. My prediction is that right now, debt is seriously over valued. Mortgages are now commonly 5 to 10 times one’s yearly salary – compare that to 1 to 2 times salary in the 70s. Much of the value of this debt simply will not be paid back – the decision the central banks have is how much of the bad debt will be bankruptcies, and how much will be devaluation. What there doesn’t seem to be much serious debate on is whether property values, on the whole, will fall back to where they would have been if they had risen at the rate of inflation since the mid 90s. I haven’t heard any serious reason to believe that for some reason the market will bear housing as a higher proportion of income now than it would in the 70s. There could be reasons why people are willing to pay more for housing now. For instance, location could matter more as a consequence of schools or whatever else. Also, while some forms of spending essentially top out at a certain level, housing is something you can always spend more on. Given that people are richer overall than in the 1970s, it may be that they devote a higher proportion of income to housing. None of that is to say that house prices are or are not over-valued, just that there may be structural reasons why bigger mortgages prevail now. “On Tuesday, the National Association of Realtors reported that pending home sales—an indicator of future sales activity—fell 16 percent in November, which was much worse than expected. That pitched the stock market lower and led analysts to express concerns that a new housing bust would snuff out the recovery. After all, housing—a massive asset class, a huge provider of employment and cash for spending—led us into the ditch in 2008. Without a housing recovery, sustainable growth seems difficult to imagine. But there are two reasons the home-sales report shouldn’t have been a big deal. First, housing is a highly seasonal business, so the most relevant statistic isn’t the month-to-month trend (comparing November 2009 with October 2009) but the year-to-year trend (comparing November 2009 with November 2008). And in November 2009, pending home sales were 15.5 percent higher than they were in November 2008. House prices tracked inflation for decades, then all of a sudden, after the Nasdaq crash, they began to rise at a faster rate. So there is a structural reason – it’s called a decade of absurdly low lending rates. Interest rates certainly played a role, but it is sensible to be wary of monocausal explanations. One related factor was the implied loan guarantee from the federal government to Fannie May and Freddie Mac. I also think it is plausible that people might have been devoting more of their income towards financing housing, since the gains from spending there seemed greater than those from spending in other areas. Those related factors are both just implications of low interest rates. People started diverting more spending there because gains were greater only because prices were rising faster than prices of other assets (a result of low interest rates), and “too big to fail” is just part of guaranteeing those rates. The rates, after all, are not set by the free market but by people acting on behalf of the state (with relative independence) with state objectives in mind. There was also pressure to loan to worse and worse debtors – but this pressure was created by the fact that money outside the housing sector grew so slowly, because lending rates were kept so artificially low! Low interest rates certainly played a role. That said, I do think housing is an area where it makes sense to spend more money as you grow richer. The neighbourhood where you live is especially important – it affects everything from the length of your commute to the level of anxiety in your life to what kind of food you have convenient access to. So, it didn’t affect those things before the Nasdaq crash? These are plausible reasons, except they fail to give a historical account. “People getting richer” isn’t something that just happens after 2000. THE effect of free money is remarkable. A year ago investors were panicking and there was talk of another Depression. Now the MSCI world index of global share prices is more than 70% higher than its low in March 2009. That’s largely thanks to interest rates of 1% or less in America, Japan, Britain and the euro zone, which have persuaded investors to take their money out of cash and to buy risky assets. For all the panic last year, asset values never quite reached the lows that marked other bear-market bottoms, and now the rally has made several markets look pricey again. In the American housing market, where the crisis started, homes are priced at around fair value on the basis of rental yields, but they are overvalued by almost 30% in Britain and by 50% in Australia, Hong Kong and Spain. Stockmarkets are still shy of their record peaks in most countries. The American market is around 25% below the level it reached in 2007. But it is still nearly 50% overvalued on the best long-term measure, which adjusts profits to allow for the economic cycle, and is on a par with two of the four great valuation peaks in the 20th century, in 1901 and 1966. It has been a year since this post went up. The shares I bought for $8.18 are now worth $9.02. That’s an increase of 10.3%, well above the rate of inflation. If I had put in $5,000 initially, I would have $5,513 now. Mine are down to 14.18$. That’s down from 15.19 in Jan. Since I bought them at 13.33 – that’s only 6%. You’re back in the lead! All this doom and gloom predicting is getting dull. I dislike markets, they are boring. To put it simply, people didn’t switch to gold as a means of exchange when things got bad. Instead, they switched to bartering for the stuff people actually needed: food, clothing, shelter, cutlery, and so on. Gold wasn’t used as a means of exchange because gold is not something people need on a day to day basis. Food is. Potable water is. Clothing is. Shelter is. Repair skills are. Gold is not. If you want to “hedge” against some sort of imagined financial apocalypse based on a very negative view of the future, don’t use gold as that hedge. Instead, spend your time building skills. Store up some dry food in your basement. Set up a generator. Become as self-sufficient as you can. These things will help you whether “financial apocalypse” happens or not. If you want to buy gold as a small part of your investments, that’s great. My wife and I have considered buying a few gold coins to keep in our safe for that very purpose. But if you’re buying gold out of fear of hyperinflation or financial apocalypse, you’re buying into marketing that isn’t borne out by the facts of history. Invest your money elsewhere, preferably in things that make you more self-sufficient. “The crisis has brought about one big change in consumer behaviour. The mortgage used to be the last debt people would default on. They did not want to lose their homes or to forfeit the substantial deposit they had had to find. But during the subprime boom many borrowers were able to buy homes without putting down any money, which changed their attitude. In effect, they were renting with an option to profit from higher house prices. THE best bet for the long term is to buy shares and hold on to them. That was the lesson hammered into the heads of investors in the 1990s when the “cult of the equity” was at its peak. Unfortunately, they absorbed the message at precisely the wrong time. The past decade has been disastrous for equities. Over the ten years to June 18th 2010 investors in developed-market equities earned a cumulative total return of minus 7.9%. By contrast medium-dated Treasury bonds returned 95.3% and high-yield American bonds 102.2%. Richard Cookson, the chief investment officer at Citi Private Bank (and a former journalist at The Economist), points out that the cumulative outperformance of high-yield bonds over equities dates back to 1995. At first glance this seems rather odd. Bondholders have first claim on the corporate sector’s cashflow and shareholders take what is left. In theory, shareholders should earn the best returns over the long term provided profits keep growing. After slumping in 2008 profits have recently rebounded and, in the case of America, are close to a post-war high as a proportion of GDP. Even if profits had been terrible, owners of high-yield bonds would have suffered too because of a likely jump in corporate defaults. The answer to the conundrum is valuation. As the cult of equity gained more and more adherents in the 1990s share prices were bid to stratospheric levels. On the best long-term measure, Robert Shiller’s cyclically adjusted price-earnings ratio (which averages profits over ten years), valuations in 1999 were more than a third higher than their previous peak, just before the great crash of 1929. It was a nice irony. Investors bought shares because they desired high returns but their enthusiasm pushed prices to a level from which high returns became impossible. Stock values have fallen significantly in the last few days due to the earthquake, tsunami, and nuclear emergency in Japan. Right now, the units in the ING Direct Streetwise Balanced Growth Fund are worth $9.54. That’s up 16.6% from what I paid in 2009, measured in nominal terms (that is, not corrected for inflation). I hold uranium stock. You can imagine how well that’s doing. My 375 units of “Central Fund of Canada” are worth 7856$, up 57% from the 5000$ I mock-invested on june 8, 2009. If anyone cares, I no longer hold fanatical views about the superiority of commodity backed currencies, or investing (really, value-storing) in commodities. I don’t know how appropriate it is, but this is also probably a good time to express confidence in Japan by buying stock in Japanese companies. They will bounce back from this, they are one of our most important allies, and it would be good of us (and probably remunerative) to help. Canon and Nikon shares aren’t a terrible idea. Tokyo is at great risk right now and huge parts of the country are in absolute shambles. If you are looking for return on investment it’s quite possible you will be waiting a long time. If charity is your motivation, they could probably use the cash more than your investment. Even if a worst-case outcome occurs at Fukushima, I am sure Japan will more-than-recover with time. What I am not sure about is the ethical appropriateness of investing in Japanese stocks now. It certainly seems more ethically appropriate than selling them off or short-selling them. PROPERTY’S grip on people is unrelenting. After the worst housing crash in memory, almost two-thirds of Americans still think that property is a safe investment. In Britain ministers hold summits to work out how to get first-time buyers into a market where prices are falling. In China anxious buyers queue to snaffle yet-to-be-built apartments. The world of commercial property is saner, but not by much. A bounceback in office values in London has prompted fears of a new bubble. Cranes dot the Chinese skyline, where more than 40% of the skyscrapers to be built over the next six years will be sited. We heard this week that Vanguard, the giant U.S. asset manager, is coming to Canada. As a permanent student of the business, I’ve been fascinated by Vanguard for many years. It’s an example of a company that grew through word of mouth. It went viral before the Internet was mature and long before Facebook and Twitter existed. Without a big advertising budget or a commission-based sales force, it now manages mutual and exchange-traded funds totalling $1.85-trillion (U.S.). The value of units in the ING Direct Streetwise Balanced Growth Fund has fallen to $8.83, amidst general stock market losses. Still, nobody said index tracking investments would be low volatility. The hope is that they will produce a good return over a multi-decadal timescale. “Inflation normally suggests investors should go for gold. But its stratospheric price, and the fact that most economists think that inflation will fall back as the global economy slows, argue against it. The result could be a very sharp fall in European GDP, with knock-on effects in the rest of the rich world. That scenario argues in favour of US Treasuries. The value of units in the ING Direct Streetwise Balanced Growth Fund is back up to $9.20. With stock markets around the world taking a bath this year, your RRSP has probably shrunk dramatically. Thanks to some foresight by former prime minister Paul Martin and some rare cooperation by provincial premiers during the mid-1990s, you’ll at least have a solid Canada Pension Plan to fall back on. The CPP was founded in 1966 as a way to give all working Canadians some financial security in retirement. Over the years, the plan’s obligations have grown, leading to worries over whether there will be enough in it to pay out as baby boomers retire. In 1997, then finance minister Martin and provincial premiers did something about it, boosting premiums and allowing the excess to be invested in the stock market by the newly created CPP Investment Board. Last year, the CPP Fund managed by the CPP IB grew by 16 per cent to $153 billion. In the last six months, in contrast, the TSX S&P Composite Index has fallen almost 15 per cent. According to the Chief Actuary of Canada, that means there will be enough money in the fund to pay out CPP benefits for at least the next 75 years. The cash in the fund comes from premiums deducted from your paycheque, and income from investments made by the investment board. None of the people I spoke to expects these concerns to miraculously vanish. Indeed they suggest we are in the first phase of a long, painful adjustment to lower living standards. The index ETF business is sometimes referred to as a margin compression game. The plain vanilla, broad index tracking exchange-traded funds compete heavily on price. An investor with $100,000 in a large capitalization, actively managed mutual fund might pay $2,250 per year in fund management expenses, but if they used the Horizons S&P/TSX 60 Index ETF that cost would only be $80. But since mutual funds come with the cost of investment or financial planning advice whether you want it or not, and also whether you get it or not, a fairer comparison would be to strip out the cost of advice. This averages 1 per cent a year for equity funds in Canada. That brings down the comparison to $1,250 per year versus $80. Add a few bucks in commissions to buy and sell ETFs and you’re still paying rock bottom costs. Active managers compete on performance, but so do index ETFs. Two of the big determinants of index ETF performance variation are costs and tracking error. HXT takes a unique approach to controlling both by using some financial engineering that some people may not understand. Due to its structure, some don’t consider HXT a plain vanilla ETF but it does track a plain vanilla benchmark. Canada’s housing market shows the “classic signs of over valuation, speculation and over supply,” but Bank of America Merrill Lynch says that’s no reason to think that there will be an epic crash of American proportions. In a report issued Monday, the bank’s Canadian analysts said record Canadian household debt and increased joblessness are cause for concern over the next year. There will likely be fewer sales, and prices could slip as much as 5 per cent in the next year. PEOPLE saving for their pensions and other long-term commitments tend to assume they should put a lot of their money in the stockmarket. Over the long run, goes the theory, equities will always produce higher returns than safer assets such as government bonds and cash because they are riskier (more volatile, in other words) and because shareholders benefit from economic growth whereas bondholders do not. That excess return is known as the “equity risk premium”. Experience during the second half of the 20th century seemed to bear out the theory. The premium was sizeable, and investors therefore poured a large proportion of their assets into equities. Yet in retrospect it looks as though the circumstances of the times, rather than the immutable laws of finance, may have been responsible for the size of the premium. Government-bond returns were savaged by inflation in the 1960s and 1970s, while equities benefited from the absence of the wars and depression that had marked the first half of the century. In recent years the premium seems to have evaporated. The Tokyo stockmarket is 75% below the peak it reached at the end of 1989. Treasury bonds easily outperformed American equities over the ten years to the end of 2011. The addiction to equities may itself have been part of the reason for the premium’s decline. Just as the belief that American house prices could never fall fuelled the subprime lending boom, so the cult of equity pushed share prices to stratospheric levels. With values so high, future returns were bound to be low. How much should people get paid for investing in the stockmarket? IF THERE is a sacred belief among investors, it is that equities are the best asset for the long run. Buy a diversified portfolio, be patient and rewards will come. Holding cash or government bonds may offer safety in the short term but leaves the investor at risk from inflation over longer periods. Such beliefs sit oddly with the performance of the Tokyo stockmarket, which peaked at the end of 1989 and is still 75% below its high. Over the 30 years ending in 2010, a “long run” by any standards, American equities beat government bonds by less than a percentage point a year. In the developed world, the period since the turn of the millennium has been a particular disappointment. Since the end of 1999 the return on American equities has been 7.6 percentage points a year lower than that on government bonds (see chart 1). That has left many corporate and public pension funds in deficit and many people with private pensions facing a delayed, or poorer, retirement. Understanding why equities have let investors down over the past decade will help them work out what to expect in the future. That’s up 27% in nominal terms, since May 20th 2009. Gold, having no yield or earnings, is hard to value. That was a help when the price was rising, since the sky seemed to be the limit. But now that the metal is falling, the lack of valuation support is a curse. Like the government-backed paper money that gold bugs despise, gold is precious only so long as enough people agree that it is. The equity markets have been booming as a result of a deliberate strategy of central banks: by forcing down bond yields, they hope to persuade investors to buy risky assets and thus restore confidence to both businesses and consumers. In much of the developed world, therefore, government bond yields are close to record lows despite the high levels of public debt, while investors get a negative return (after inflation) from holding cash. Equities look like the best bet. That’s up 45% in nominal terms, since May 20th, 2009, and up 14% from March 15th, 2013. That’s up 64% in nominal terms, since May 20th, 2009, and up 13% from March 15th, 2014. A little less than four years ago, the world looked like it was about to end and gold hit an all-time high of $1,895 an ounce. The United States had manufactured a debt crisis, and Europe hadn’t been able to manufacture a solution to its actual debt crisis, so panicky investors sought safety in the same place they had for 5,000 years: a shiny rock. The only problem, as you might have noticed, is that the world did not, in fact, end. It’s still here, so gold prices aren’t. The yellow metal has fallen 42 percent from its peak—and 8 percent in just the last month—despite the fact that the Federal Reserve has printed more than $1.5 trillion in this time. That, after all, is what gold aficionados said would make its price go to the moon, if not infinity and beyond. So what’s happened? Well, exactly what economists said would happen. When you think about it, a bet on gold is really a bet that the people in charge don’t know what they’re doing. Policymakers missed yesterday’s financial crisis, so maybe they’re missing tomorrow’s inflation, too. That, at least, is what a cavalcade of charlatans, cranks, and armchair economists have been shouting for years now, from the penny ads that run on the bottom of websites—did you know that the $5 bill proves the stock market is on the cusp of crashing?—to Glenn Beck infomercials and even hedge fund conferences. Indeed, John Paulson, who made more fortunes than you can count betting against subprime, has been piling into gold for six years now, because he thinks “the consequences of printing money over time will be inflation.” They all do. Goldbugs act like the Federal Reserve’s public balance sheet is a secret only they have discovered, and that it’s only a matter of time until prices explode like they did in the 1970s United States, if not 1920s Germany. But economists do, for the most part, know what they’re doing. Sure, they missed the crash coming in 2008, but that wasn’t because they didn’t understand how bank runs work. It was because they didn’t understand that unregulated lenders had become vulnerable to runs. And the economists who haven’t forgotten their history knew that this inflation fear mongering was all wrong too. Specifically, there’s a difference between the central bank buying bonds, a.k.a. printing money, when interest rates are zero and when they’re not. In the first case, money and short-term bonds both pay the same amount of interest—none—so, as Paul Krugman has explained over and over again, printing one to buy the other won’t change anything. Banks won’t lend out any new money, and will just sit on it as a store of value instead. That’s what happened when interest rates fell to zero in 2000s Japan, and it’s what is happening now in the U.S., U.K., Japan, and Europe. That didn’t mean, though, that gold wasn’t a good short-term investment. It was. Just not for the reason goldbugs thought. Now, the problem with gold is it doesn’t pay any interest or dividends, but it does cost money to store. So you have to pay up in the hope that it will pay off by going up in price. That usually makes it a pretty lousy investment. That calculus changes, though, when you’re being paid to borrow—that is, when you’re paying a negative real interest rate. But when does that happen? Well, when inflation is high but interest rates aren’t quite as high, like in the 1970s, or when inflation is low but interest rates are lower still, like today. And that, as Paul Krugman and Larry Summers argued, is why gold prices were going up so much even thought inflation wasn’t. And that, as Paul Krugman and Larry Summers argued, is why gold prices were going up so much even though inflation wasn’t. It almost makes you feel bad for the goldbugs, until you remember that some substantial number of them are just trying to scare seniors out of their money. But the ones who aren’t really thought the 1970s showed that gold went up when inflation did, so the fact that gold was going up now meant inflation couldn’t be far behind. They didn’t understand that the price of gold doesn’t depend on how much inflation there is, but rather on how much inflation there is relative to interest rates. So now that rates are rising, gold, as you can see below, is falling. Wait a minute, rates are rising? Well, yes. The Federal Reserve hasn’t actually raised rates yet, but it has talked about it enough that markets have reacted as if it already did. That’s been enough to make real rates positive again. That sound you hear is goldbugs insisting that this is just a flesh wound. Sure, gold is down a lot, but that makes this is a buying opportunity! Just wait until China starts snatching up gold as an alternative to the dollar. Then prices will shoot back up. That, at least, was the story they told themselves until earlier this week, when China revealed that it hasn’t been purchasing nearly as much gold as people had assumed. Not only that, but a big fund dumped its gold in the middle of the night, driving the price down to a 5-year low. That’s left the goldbugs most impervious to empirical reality with nothing to say other than that “gold hasn’t lost any value, the dollar has just strengthened.” Right, and my stocks aren’t worth any less, I’d just get less money for them if I sold them. The U.S. real estate bubble burst in 2007, after a run-up that began in the early 1990s, around the same time as Canadian real estate started its current ascent. Many Americans who bought their first home 25 years ago are still feeling the pain today. On an inflation-adjusted basis, the net worth of U.S. families headed by someone aged 41-60 has fallen by about 1/3 if you compare 1989 families to those in 2013, meaning this generation of middle-aged Americans is less wealthy than the previous generation. Given that homes cost more in Canada (averaging $453,560 nationally vs. approximately $311,619 in the U.S.) and household debt is higher here as well (Canada’s debt-to-income ratio is 1.63 versus 0.96 in the U.S.), Canadian millennials should pay close attention to the advice being doled out by the U.S. central bank. In particular, the researchers are worried about young people putting what little savings they have into a home and having a mortgage so large they are unable to save in the future. This will be a big concern when interest rates rise in Canada and mortgage payments take a bigger chunk out of budgets, further limiting the ability to save. Furthermore, an inability to accumulate non-real-estate assets means the net worth of young people is becoming increasingly undiversified. Being all-in on real estate leaves little opportunity to consider other asset classes, including stocks. Historically, stocks have been a great way to grow wealth. Over the last 60 years, the Toronto Stock Exchange has grown 9.5 per cent, while inflation has averaged 3.7 per cent, yielding a 5.8 per cent real return in excess of inflation for Canadian stocks. The Canadian Real Estate Association began publishing consistent average home price data 35 years ago, in 1980. Since then, average home prices have risen 5.4 per cent, while inflation has averaged 3.1 per cent. The real rate of return on real estate, after inflation, has therefore been about 2.3 per cent. If stocks generally perform better than real estate in the long run and millennials put everything they have into real estate, they might be making a costly mistake. Since this seems to apply in an average real estate market, Canada’s current housing market would likely magnify the difference. That’s because, in a hot real estate market, young people need to be cautious about putting their modest savings into a downpayment on a home that may end up being their only asset. If they overpay and then run into financial difficulty or the real estate market takes a downturn, it could take years for them to recover their losses. Consider that a 5 per cent home downpayment — the minimum currently required in Canada — amounts to 1,900 per cent leverage (that is, the mortgage is worth 19 times the downpayment). Prior to the 25-year bull market in Canadian real estate, buyers needed a much more conservative 25 per cent downpayment. ARE equities always the best investment for the long run? It is the message that is usually sold to individual investors. The message is based on theory; equities are riskier than government bonds so should offer a higher return (the equity risk premium, in the jargon) to compensate investors. And the message seems to be borne out in practice, most of the time. But there is an important caveat. Much of the data quoted by investment advisers is based on America, which is something of an outlier; it turned out to be the most successful economy of the 20th century but that was not guaranteed in advance. An investor in 1900 might have picked Germany as a rising power, only to see their assets wiped out in the 1920s hyperinflation and the Second World War; they might have picked Argentina, which was a perpetual disappointment. In other countries, there have been very long periods in which equities have not been a great investment. Elroy Dimson, Paul Marsh and Mike Staunton of the London Business School are the acknowledged experts on global investment returns, having compiled data covering 22 countries over more than a century. As of February 2013, the longest period of negative real returns from US equities was 16 years. But it was 19 years for global equities (and 37 for world ex-US), 22 for Britain, 51 for Japan, 55 for Germany and 66 for France. Such periods are much longer than most small investors would have the patience to wait. Another way of looking at the same issue is whether equities beat bonds over the long term; whether the risk premium is really delivered. This chart, a favourite of Albert Edwards of SocGen, shows the returns from equities (MSCI World, including dividends), long-dated government bonds (over 10-year maturity) and 3 months dollar cash since 1996. Bonds are still winning, even after the big recovery in equities since 2009. The unit price for the Streetwise Balanced Growth Portfolio is now $12.95, down 3.2% from last year. The unit price for the Streetwise Balanced Growth Portfolio is now $14.33, up 10.6% from last year. BlackRock’s iShares MSCI ACWI Low Carbon Target ETF is at $137.59. Indeed, having analysed the data, Messrs Dimson, Marsh and Staunton reckon global investors are expecting a risk premium of 3-3.5% relative to Treasury bills—a level that is lower, not higher, than the historic average. So something does not add up. American pension funds are optimistic. Businesses are cautious. Shares are trading on very high valuations. Not all these assumptions can be proved right. WHO would bet against the Sage of Omaha? In 2007 Warren Buffett, America’s most accomplished investor, predicted that during the next ten years the S&P 500, the country’s leading index of large-capitalisation shares, would outperform a portfolio of hedge funds. He offered a $1m bet to anyone who disagreed. Only Ted Seides, a hedge-fund manager, dared to take up Mr Buffett on the wager. Sure enough, he lost spectacularly. With eight months left before the decade was up, Mr Seides conceded defeat. His five hedge funds had produced a combined annual return of just 2.2%, against 7.1% for the S&P 500. The cyclically adjusted price-earnings ratio (CAPE), as calculated by Robert Shiller of Yale University, averages profits over ten years and is used by many as an important valuation indicator. Currently it shows that American shares have hitherto been more highly valued only in 1929 and the late 1990s, periods that were followed by big crashes. It is possible that this shift is permanent, and that profits will not fall back as they have in previous cycles. But it seems the height of optimism to believe that profits will grow faster than GDP, ie, that the overall share of capital will rise even further. Indices covering art or musical instruments are much less comprehensive than those covering shares. There may be an upward bias inherent in collectible returns, as successful works are more likely to survive. Transaction costs, if valuables are sold at auction, may be 30-40%. But these are the kind of assets that tend to be held for many decades (and passed between generations) so the annual cost burden may compare reasonably with equities, which are traded much more frequently. The academics calculate that, after tax, collectibles have generated higher returns than equities for British investors since 1900. Perhaps the most surprising finding in the yearbook is that gold and silver have both done worse than cash and bonds over the past 118 years, despite high inflation during much of that period. In fact, gold performed best in real terms (although only as well as Treasury bills) when there was sharp deflation. Gold did substantially outperform T-bills during high-inflation periods, but this hedge comes at a long-term cost.